[There exists a wonderful site on the internet called Uncyclopedia.org, meant to parody Wikipedia with its own versions of “encyclopedic” articles. Being a big fan, I thought I might try my hand at writing an article of my own. Here’s my take on the American Samoa. The American Samoa, an integral part of the nation’s history, is located just inside the pantries of millions of families. Known for its unique characteristics and addictive texture, the American Samoa is by far the most-consumed U.S. territory in the world. The Samoa is so popular, in fact, that an island in the Pacific has been named after it. 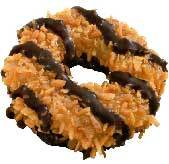 The American Samoa was first discovered in 1917 when a band of Girl Scouts encountered its recipe. They quickly reported the find to their troop leaders, who suggested that they find a way to allow more Americans to visit the Samoa. Extensive territorial mapping commenced in the mid-fifties; it concluded with Troop 141 leader Maggy Peters adding a tablespoon of sugar to the recipe. Scientific studies show that the Samoa is the only island that travels door to door each year, selling itself in honor of the first Girl Scout discoverers. The Samoa, at approximately two inches in diameter, is one of the smaller regions in the United States. It appears to be a richly forested island, with plenty of coconut appearing around the outer rim. In the middle, however, lies a giant crater whose origin is unknown. The Samoa features four dark-colored rivers, most of which have solidified and have a reportedly sweet consistency. Unfortunately, the American Samoa is subject to annihilation by means of a natural disaster known as “Eating,” in which its entire surface is mashed up by a series of white stones. Millions of Samoa acres are subject to this brutal event every year. There are two distinct seasons in the territory: baking season and storage season. The first begins with a humid, lukewarm period and concludes with temperatures as high as 350 degrees; these heat waves can last for up to two hours, when the season abruptly ends. Storage season is somewhat longer, and usually entails dry, stable weather at temperatures around 60-70 degrees. Most tourists visit the Samoa during storage season. The Samoa was at the epicenter of a regional controversy on December 19, 2007. Billy Walsh was about to destroy the Samoa by eating when his sister, Sarah Walsh, intervened. Sarah claimed that she had territorial rights over the American Samoa, but Billy retorted, saying that he had finished his math homework first. The event quickly escalated into a shout match, ending only when mediator Johnny Walsh took the Samoa and ate it himself.